In this installment of INSIDE GESAB, we invite you know the videowall, TFTWall and LCDWall solutions and the company offers. Every 24x7x365 operational center needs the best visualization systems for the control job. GESAB, as an expert company in the conceptualization, design and implementation of control centers, together with its partner BARCO offers the latest technology with the highest quality and durability. In GESAB, we are specialized in the installation of visualization systems for control centers and control rooms. Our objective is to satisfy the necessities for 24x7x365 environments. We have the experience to confront the singular requirements of these high technology environments. Our experience, of more than 20 years,has taken us to work in all the sectors: Transport and traffic, energy, industry and consumption, public administrations, sanity, finances, security and defense, telecom and media. GESAB provides its clients the lastest technologies in visualization systems with the purpose of giving the operators the capacity to answer in real time to the events that take place. The Videowall DLP and LCDwall visualization systems , together with powerful image processors, allow the operators and administrators of control rooms the maximum variety of capacities of possible operability in critical activities. For control room applications, GESAB uses BARCO products, world leader in the technology of video processing. GESAB is able to provide the customers solutions of excellent quality and functionality, just as Barco acredits. GESAB is the only company certified in Spain for the installation and commissioning of the new range of videowall systems of the OL series and OVL LED technology.. The back projection module with LED technology offers an experience of excellent visualization from the ergonomic point of view, with the clearest and most saturated colors. The screen has been designed so that it works perfectly without maintenance during many years and without the necessity of consumables. The OL series Sense6 is a unique sensor technology that provides a color stability and includes a continuous shine in the whole screen. Sense6 constantly measures the shine and the color and it adjusts the color space to provide the most appropriate image for the human eye. This means that it does not require manual adjustments neither maintenance. Thanks to the little depth of the projection module, the OL screen can be placed easily in small spaces. 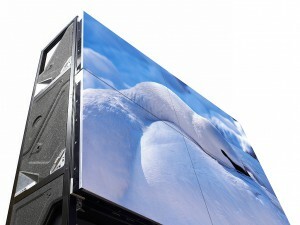 The specially resistant design makes the screen ideal for industrial environments. The projection system with LED OVL technology by Barco has been improved with a liquid refrigeration system, which means the LED illumination increases to a new level of shine. The projection OVL module by Barco offers an experience of excellent visualization from the ergonomic point of view, with the most brilliant and saturated colors. The OVL screens have been designed so that they work perfectly without maintenance during many years and without the necesity of consumables. The new OVL screen Sense6 by Barco, a technology of unique automatic calibration that provides a color stability and continuous shine and in the whole screen. This means that it does not require manual adjustments neither maintenance. Thanks to the design of the modulate of the OVL projection unit, the OVL projector can also be used to modernize modules of existent back projection of the Barco Overview D series. To supplement the back projection screens, Barco designed the NSL series.The professional LCD high resolution screen is the ideal solution for the videowall applications with tiles for control rooms of half and small size. The NSL series present a 55? LCD screen, with back LED lighting with, combining this way the high shine with a wide color range and a thin ultra mark for an excellent visual yield. Screen without frame for videowall with tiles. The new NSL uses feedback with durable LED that is placed directly behind the LCD panel . Also has the thinnest frame on the market, which offers an excellent visual yield in mosaics. The NSL-5521 offers the best image quality in regards to resolution, shine and visualization angle. Since the back lighting LED reduces the aging and the coloration in the filters and polarizers LCD, the NSL-5521 has a panel with a long life, which means that the screen cube is perfectly appropriate for prolonged use. LCD Technology with mosaic configuration: the correct election for your control room. Contrary to the front projection, the LCD screens with use have a lower maintenance cost, a better contrast and they are not affected by the environmental light. The plasma technology: the LCD with configuration in tiles consumes less energy and they are not subject to irreversible and permanent burns. Contrary to the LCD screens with normal frames, the LCD offers a bigger scalability; they minimize the distraction of the frame and they allow a good use of the surface of the screen with high resolution. On the contrary to the LCD screens with lamps, the LCD with tiles and back lighting LED offer more shine, a good image quality and a long life expectation. The same as all the systems of videowall of Barco, the cubes can adapt in a flexible way to any form and size. The lively colors are a characteristic featured registered mark of the video screens LED of Barco that lead to a spectacular stereoscopic experience. The cubes can be combined to create any solution with high visualization resolutions.